Michael Cimeno is a director that I, admittedly, was not too familiar with. His success as a director apparently began and peaked with The Deer Hunter – his later films would bomb in the box office and extinguish his rising star. Hollywood’s unforgiving reaction toward bombs break careers, and given the monumental failure of Cimeno’s follow-up feature to The Deer Hunter, Heaven’s Gate, one has to wonder how the man managed to make a film afterward (his career would die slowly, as he made his last American feature, The Sunchaser, in 1996). The Deer Hunter’s success comes across as fascinating to me – I certainly don’t think that the film would be remotely profitable in today’s marketplace. Regardless, the film played well, critically and commercially, in its time and ushered in the promise of a significant new director. The whole situation reminds me of the recent Academy Awards – best Director and Feature was awarded to Tom Hooper (a newcomer) and The King’s Speech (a surprising box-office success). Interestingly, both The King’s Speech and The Deer Hunter could not be any more different. The classes of people on display are polar opposites, with the plights that plague its central characters ranging in intensity. Both films are effective in their emotional gravity, though their disparity in subject matter is interesting in seeing how far we’ve come from the late 70s system of directorial visions to studio designed filmmaking. Cimeno’s unfortunate turn of events should not distort the perception that one has for the film that put him in the spotlight in the first place though. Cimeno and screenwriter Deric Washburn begin with a promising idea – we open on a bunch of blue-collar workers who are days away from going to Vietnam. 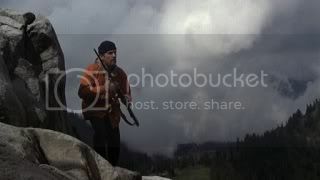 The first hour of The Deer Hunter establishes how three men (Robert DeNiro, Christopher Walken, and John Savage) see the war as an opportunity to attain glory. Their workplace does not offer that promise nor does hunting fulfill that desire. The belief, to them, is that war will provide greater meaning to shooting a gun, to a bullet, to the trigger, and to their lives. This naïve perspective comes to a head when the three men are captured in Vietnam, where the game of Russian roulette serves as a metaphor for the randomness of death and the mechanization of war. Nobility is a pipe dream – in the warzone, death becomes an increasingly appealing alternative to living with the echoing sound of a trigger going off – are you relieved that the chamber is empty or disappointed that you’ll have to hear that click again? Cimeno’s direction during these life-or-death scenes is incredible. He holds the camera for just the right amount of time, angles at just the right position for you to get the full effect. You see the chamber move and genuinely fear for the lives on-screen. All three of the central leads effectively convey a sense of urgency and despair in their trials, none more so than Christopher Walken. His young appearance makes him stick out like an alien-figure in the blue-collar community that The Deer Hunter begins in. But as the film progresses, Walken’s youthfulness and ambition fades. He becomes a mechanism of the war – a cog. That sense of mechanization is something The Deer Hunter touches on constantly, becoming fully realized in Walken’s character. The Deer Hunter is not without its faults. Cimeno and his cinematographer, Vilmos Zsigmond, frame things beautifully, but at times, there were a lot of unnecessary scenes that didn’t serve a greater purpose. This was particularly glaring in the opening hour, where a wedding sequence runs far too long. The sequence is meant to establish certain relationships, as well as build a sense of community and tradition within the context of the narrative that would serve as criticisms for what happens during the war. The prolonged nature of The Deer Hunter’s beginning becomes even more unnecessary when considering the whole narrative- there are definitely hiccups in pace toward the end when Robert DeNiro’s character sets forth on finding his best friend. Given how detailed Cimeno was about from the onset, it’s disappointingly obvious that he’s sprinting toward the finish line. The Deer Hunter is a film that marks a convergence of artistry with commercialism. There’s a blend of popular music and familiar faces within the confines of a gripping narrative that does not adhere to a typical form. The grit associated with violence is far from glamorized; the loss of life is felt as something greater than a mere narrative device. It echoes a sentiment that cannot be easily deciphered – the ending, in particular, provokes a variety of reactions. 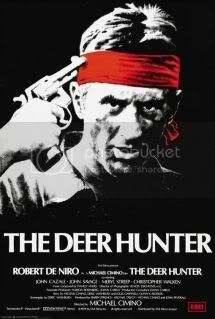 In that, it’s difficult to classify The Deer Hunter. But given Cimeno’s reputation, I fear that it’s a film that is unfortunately relegated to something of a “one-hit wonder”, when it obviously transcends that notion.